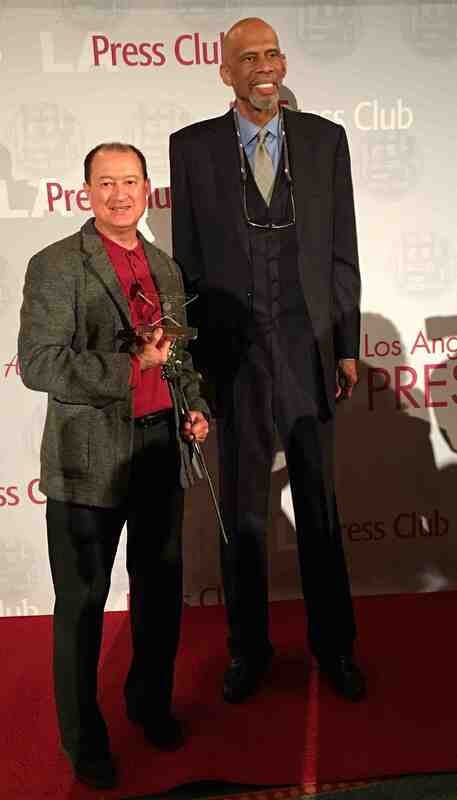 Rafu columnist George Toshio Johnston with his Los Angeles Press Club award for commentary. The Los Angeles Press Club gave its first-place award to George Toshio Johnston in the Commentary Diversity/Gender (Online) category at its 10th annual National Arts & Entertainment Journalism Awards. George Toshio Johnston with fellow awardee Kareem Abdul-Jabbar. Johnston began contributing to The Rafu Shimpo in 1992 as a media columnist and wrote nearly 650 columns. He also had a stint as the newspaper’s director of business development and is now the senior editor of digital and social media for Pacific Citizen. Over his journalism career, he has worked for the Wave Newspapers, the Daily Journal Corp., The Pasadena Star-News, The San Gabriel Valley Tribune, The Orange County Register, The Hollywood Reporter and Investor’s Business Daily. 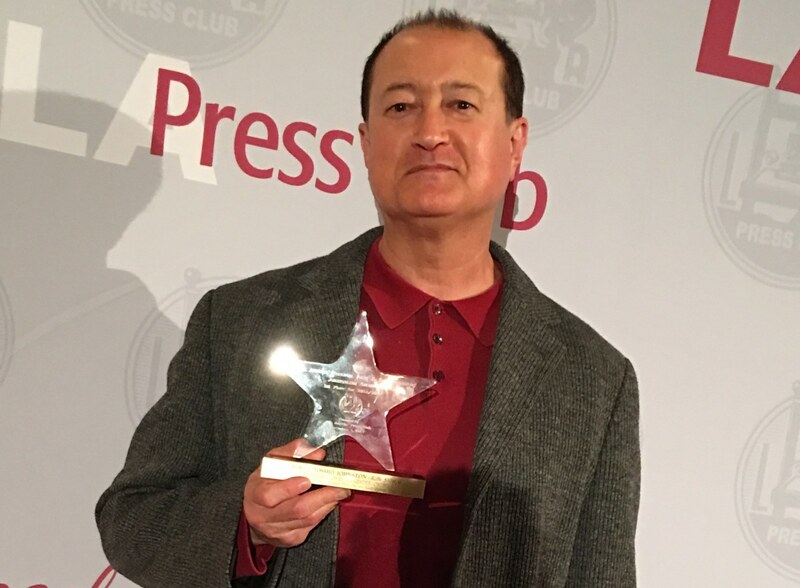 “I appreciate The Rafu Shimpo giving me the opportunity for 25 years to write about media-related issues and topics of interest to Japanese Americans, Asian Americans, Japanese from Japan and other Asians,” Johnston said. “Even in this age of social media and the internet, The Rafu Shimpo is a unique daily newspaper that provides news coverage and gives opportunities for community-based writers that would not otherwise exist. Other finalists in the category were Melissa Leon of the Daily Beast (second place), Rebecca Sun of The Hollywood Reporter (third place), Kristin Marguerite Doidge of GOOD Magazine and Dina Gilio-Whitaker of **LA Weekly. Special awards presented during the journalism gala included the Storyteller Award to Joan Ganz and Lloyd Morrisett for the long-running educational TV show “Sesame Street”; the Luminary Award to Claudia Eller and Andrew Wallenstein, co-editors of entertainment trade Variety; the Legend Award to author and basketball luminary Kareem Abdul-Jabbar, who also won an award in the Columnist category for his contributions to The Hollywood Reporter; the Visionary Award to actress and animal rights advocate Tippi Hedren; and the Impact Award to New York Times investigative reporters Jodi Kantor and Megan Twohey, who reported on accusations by several women of decades of sexual misconduct by now-disgraced movie producer Harvey Weinstein. For a complete list of winners, visit http://lapressclub.org.